Excellent clubhouse with Bar, Catering & Professional shop. Trolley hire. Golf practice area. 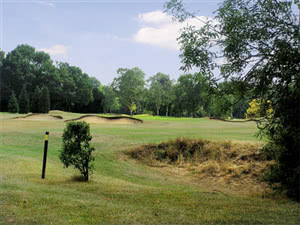 Romford Golf Club was originally designed by Open Champion James Braid and in more recent years has been used as a Qualifying venue for "The Open". Rumour has it that there is a bunker for each day of the year and it certainly seems that way! Situated just a couple of miles from junction 28-29 on the M25 and only 18 miles from the centre of London. We welcome Golf Societies on weekdays, except Wednesday, for a minimum of 12 and a maximum of 40 players. I'd hoped it would be better! I've heard a lot about Romford as it is one of the oldest and most prestigious clubs in my area. So when I got a chance to play it on a Sunday for £35 I took it(I was with a Golf Professional). Romford don't like pay and pays but we managed to get a decent enough deal. The first few holes seemed interesting enough, but then there's a lot of crossing over and a few matted tees (three I think). The course was dry enough considering the rain we've had. But a lot of the holes were samey. The greens ran true but a little slow. The bunkers were sparse for sand. Fairways were long with very little run & with 450 yard par fours tough for us shorter hitters. It was nice enough for this time of year but its usually £65, and its certainly not worth that. Its a very traditional club with a very traditional tight parkland course. It was a very windy cold day to play a tight course that you don't know your way around, I'm sorry but I did not feel the love...but that's just me! I went to Romford Golf Club with a member today. I found the course to be in very good condition especially the greens, although most of them are quite tough to play. I also found the other members on the course pleasant to talk to but that may be down to the fact that I was with another member. The clubhouse is quite traditional with an added bonus of a mini museum dedicated to James Braid, the course designer. I would say this course is well worth a visit although it plays quite tight in places. Its a shame to have to write a review about the club again,focused just on the members. This is a great course in great shape,the only problem is the some members make you feel very hostile,and not welcome. I was challenged today,by A LADY member,telling me I had no standing on the course,and should be letting the members through behind me playing a club comp. I already let a few groups through,and was not going to be dictacted to by someone who should have been playing her own game. A few more comments where made about visitors,playing on their own.I told her and the guys she was playing with,a few facts,that I had paid my green fee my bag tag on show,and what I felt about being challenged by a total stranger. If I had broke the rules fair enough,put me right.This has given me a very different view of a golf club I enjoy playing. IT WILL BE A LONG WHILE BEFORE I GO BACK. This club will take a lot of beating it gets better every year,the warm welcome from Chris Goddard the PRO,sets you off in a positive mood. The Green Fees are £25,great VFM. The course is quite tight and needs thinking about,there are a variety of holes,you will use every club in the bag. A course planner is a must,there are bunkers aplenty and sited for purpose(beware).The fairways are good,and the greens are fantastic to putt on,very tricky to read as well. This course is a regional qualifying for the "BRITISH OPEN" so it does have character and standing. a typical English Golf Club,with loads of tradition. Restricted for space to expand here, a number of tees play back over the previous green which could be awkward if the course was busy; fortunately it wasn't when we visited and we had a very enjoyable round. No stand-out holes, but a bit of variety. The half-way house is well placed and the clubhouse welcoming.